With Capt. Steven Lamp - Veteran Key West Fishing Guide. Take the worry out of group gatherings working with us here at Dream Catcher Charters. We are not only the premier guide service here in Key West Florida but also the largest on line referral company for fishing charters out to reputable fishing guides in the Florida Keys and Key West. What we cannot handle in our own house we arrange with others. This takes a tremendous burden off of destination managers and group planners when coming to Key West. We will have the boats ready to go for you when you need them. We guarantee our services and have been doing this for 10 years here in Key West. In order to wrangle boats in Key West to get a large group out on the waters you need a center contact that is immersed with these boats every day, Especially when mixing the types of fishing your group has in mind. Capt. Steven and Gennifer are without a doubt the very best in group arrangements for groups of 200 persons or less per day on the water. Any more than that, depending on time of the year we don't have enough boats on the island. We offer the best in on the water entertainment. We organize fishing tournaments that can last for a 4 hour trip or for days. This can come with a little awards ceremony at the end of the fishing to award the winners with trophies or gift certificates or whatever. Team building in fishing is easy. Put a group together and organize a Species hunt. Your groups each boat fishes for additional species of fish with their guide adding up points. Its allot like an Easter egg hunt with a fishing pole. We offer a full line of accommodations that want your group of 10 rooms or more. We broker out your needs to the different places and find the best prices for your group and get VIP rooms that are needed as well. Our sister company The Keys To Key West inc. works the deal for your group saving you time and money. WE book the rooms for you and invoice your company for master billing. That's easy. There are many transportation companies in Key West that offer people moving services for a small fee. We organize with them the times your group needs to be at the boats and at the different marinas. Your group moves about the island effortlessly getting to their destinations on time. You get our full undivided attention when here on this island if you are our group. This means start to finish. When you arrive some of our groups like us to meet with them and their party to tell of the fishing and activities, a few minute seminar given by Capt. Steven Lamp. We recommend this as well to allow for folks to make last minute adjustments or ask questions. This also allows us to see the special needs if any in your group with our experience to ensure they have a great time too. Each fishing day we have a person from our organization at each dock your people will be going to to introduce them to the boats and crew. This is also where we insure that each boat has the proper beverages and items you have requested. This eliminates the confusion. Upon returning since we often do not know what time they return the transportation will be there waiting to take them back to hotel. Fish caught and kept by your group will be filet up and sent to hotel for possible meals if desired. For the tournament events we like to have a small banquet to award the participants with trophies and for us to say thanks. In some instances on our fishing tournaments this is also a good time for the fishing guides to join us for an adult beverage and tell stories of the day. Who better to have book your fishing boats for your large group or tournaments than the folks who are in the business to run both? 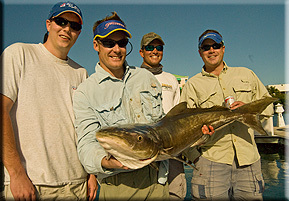 Contact Gennifer a call and see what all is involved in booking a group fishing trip to Key West and the Florida Keys. Our office can be reached at 305 292 7212... Our drop Gennifer an e-mail at islandgenn@me.com.